24/05/13: British police Friday arrested a couple of passengers on suspicion of endangerment of aircraft after forcing Pakistan International Airways (PIA) Flight PK709 to land at Stansted airport following a mid-air alert, Geo News reported. According to sources both the British nationals of Pakistani origin were arrested after they reportedly had a spat with the crew. According to PIA sources the suspects had allegedly threatened to bomb the plane with explosives. A panicked stewardess alarmed the pilot, Captain Nadeem Sufi, who sent a stress signal to London control tower triggering the security alert, which led to the force-landing of the plane. There were 297 passengers and 11 crew members were on the plane. Initially Essex Police said that a man namely Mohammad Shafqat, and a woman, Ammara Ashraf were arrested and removed from the plane, which is on an isolated runway at the airport. Reportedly, it all started after Mohammad Shafqat and Ammara Ashraf, traveling with a number of other family members, engaged in a hot argument, which went out of control forcing the crew to intervene, who were warned to stay out of it. The quarreling family went as far threatening the crew that they were going to blow the plane up, which caused this whole panic. However, they were released after police found out it was a petty domestic squabble. The incident was not believed to be terrorism-related, the officials said. "There was a family of eight to 10 people on the plane and they were wrangling among each other," the PIA source said. "When PIA staff approached them and asked them to calm down, they told them to go away otherwise they would blow up the plane. "PIA staff became scared and they raised the alarm to avoid any untoward situation." A passenger Nauman Rizvi told Geo News that two passengers who had tried to move toward the cockpit during the flight were handcuffed and arrested once the plane landed. Rizvi said that after the men were taken away, the flight crew told passengers there had been a terrorist threat and that the pilot had raised an alarm. Later, there were reports that another couple of men apart from the fussing spouses were also arrested amid the panic. Two men, aged 30 and 41, were held on suspicion of endangerment of an aircraft, Essex Police said Earlier, Royal Air Force (RAF) Typhoon jets were scrambled to intercept the PIA plane, which escorted the Manchester-bound flight to Stansted. 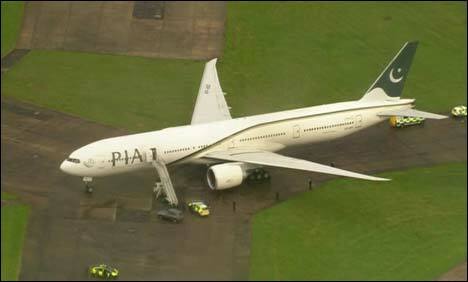 Flight PK709 from Lahore was due to land at Manchester Airport in north west England at 1230 GMT. The plane was diverted to Stansted airport, east of central London, according to a Manchester Airport spokesman. A spokesman for the British Ministry of Defence said that Typhoon jets had been launched from a Royal Air Force base after the incident was signaled by the plane's crew, shortly before the plane was due to land in Manchester at 1230 GMT. "Typhoon aircraft from RAF Coningsby have been launched to investigate an incident involving an aircraft in UK airspace," the MoD spokesman said. After the plane landed, the MoD spokesman said the incident was now a police matter and "our involvement is over". Typhoon planes can be scrambled if the pilot or crew of a passenger aircraft sends out a passenger signal, he added. Essex Police, who are responsible for the area where Stansted is located, said an incident had occurred on a flight and they were investigating. "The plane diverted to Stansted Airport has now landed at the airport. Police + partners are continuing to respond," Essex Police in southeast England said in a Twitter message. All the passengers were disembarked at the Stansted Airport and no one has been hurt, an airport spokesman said. According to a statement issued by Pakistani High Commission, a team of the officers was sent to the Stansted Airport to provide any consular assistance to the passengers that may be required. The High Commission is keeping the authorities informed back in Pakistan and is also in touch with the PIA office in London, the statement added. The news comes two days after a soldier was hacked to death on a London street in an incident the government are treating as a terrorist incident. Reported by The News, Pakistani Newspaper.